EventName = a string containing the event you want to listen to. functionToCall = The function to call when the event is fired. ////Invoked when there is a change in the ad availability status. //Invoked when the Offerwall is was not successfully shown. //Invoked after the Offerwall screen has opened. //Invoked after the Offerwall screen has closed. The default setting in your ironSource account notifies you of user’s completions or rewards via the ironSourceDidReceiveCredit callback within the client of your app. Additionally, you can turn on server-to-server callbacks to receive additional notifications to your back-end server. If you turn on server-to-server callbacks in addition to the client-side callbacks, remember not to reward the user more than once for the same completion. ironSource will fire both the client-side callback and the server-to-server callback. You will get two notifications for each completion. 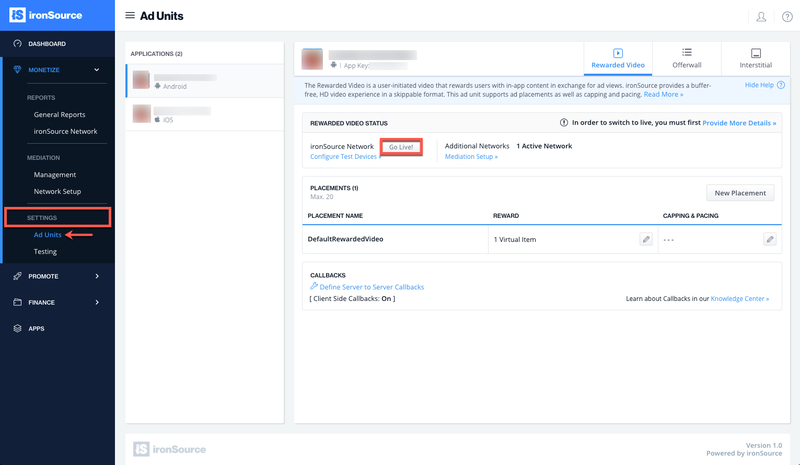 We will fire a server-to-server callback to the selected location with an Event ID which is the unique identifier of the transaction. For us to know you’ve granted the user, you must respond to the callback with [EVENT_ID]:OK anywhere within the HTTP payload of the callback. To utilize server-to-server callbacks, see here. If this is a new integration for your application, your app will by default be in ‘Test Mode‘ on your ironSource dashboard. While your app is in Test Mode, the ironSourc SDK will print more logs to the console in order to provide greater visibility into the SDK processes. To test your ad inventory, set up your Test Devices. Until you turn on live ad inventory, you will receive test campaigns that don’t generate revenue. Make sure to select ‘Go Live!‘ on the Ad Units page when your app is ready for live ad inventory.